I changed the pattern for the squares a little bit from the original one. I used a smaller starting square. Changed to ch2 for the corners, with a ch1 in between the 3dc clusters, which makes more sense when it is time to do the join-as-you-go. These squares are about 8 inches each. Easy to be creative and change this by adding or subtracting half-rounds to change the size (easiest to do this by 2 half-rounds so it works out properly). You could also use squares that are all the same design as far as how you arrange the colors, or a few different ones instead of making them all different as I did. You could also add a border around each as I did in the original – lots of possibilities! I have a ways to go on it still, and a border to decide on. I will post more photos on how to do the squares, join them and the border when it is closer to finished and I actually know how I will finish it! I used a standing stitch to start each new color, instead of attaching the new color with a ch3. 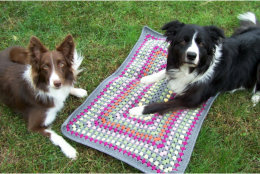 You can substitute a ch3 or your own favorite way to start a new color on granny squares. Each new color is started with the wrong side facing. I judge the wrong and right sides by the first little square. Updated post on 1/21/17 for clarity and to talk about and include a link for a standing stitch. Thank you, your pattern is just right, I really enjoy your site. What is a standing stitch? It is a way to attach the new color on the next round with a dc instead of a ch3. I updated the post to include a link to my tutorial on how I do those. Love this – and it is SO good that you give the charts too! I played around with your original post, the mitered granny square, and really liked the look of it, but this design here I like even better, especially the idea of different styled grannies together. I will be looking forward to see how you finish it and what border you choose. What is your goal as to finished size? This I am making as an afghan or throw. I am starting with rows of 5 motifs across for now. That may change to 6 depending on what I decide to do with the border. I inherited 30 of these from someone who can no longer crochet due to arthritis. In your post you state you did not intend to do a border, but since I have never worked on granny squares can you suggest a way to connect them? Or will that come in your “ta-dah” post when your project is complete. This particular one is connected by a join as you go method (you can see in the photo that they are already joined). That method is done on the last round of the squares. My post on mitered granny square has a border and is also done join as you go. I do have a post showing how to do join as you go, don’t have the link handy but a search should find it. Thank you. I found it on the original Mitre Square post. I think I can handle that! Thankyou Sue for your lovely pattern. I have just finished making it in four colours not five. It has turned out beautiful. I now have to do a border. Did you do clusters around and then single crochets with the colours that you used. I just want it to look exactly like yours . If I knew how I would post a picture , but I can crochet better than I use technology. Mine has been put aside, it isn’t finished yet. I haven’t decided what I will be doing with the border, that often is decided when I try a few things to see how it looks. Your idea sounds lovely, I have done that with other blankets. How do I calculate how much yarn I need to buy to make a mitered granny square blanket. I know it depends on the size I want but I don’t know how to figure out how much I need. You can try looking at other blankets that are a similar size and stitch and estimate from there. It can be tricky as it also depends on how many colors you use, and how much of each. I always buy more than I think I will need just in case.